Chat Bots are back, good bots anyway and have started to gain some traction in the marketplace with more and more people speaking about the business implications. With Facebook’s announcement at F8 the spotlight has risen and over the course of the next year I am sure we will see lots of activity in this space. The full list of FB 2016 Messenger Partners shows an interesting mix of use cases. I believe the applications that offer commerce and/or customer service elements are actually the most useful. The news based feeds are interesting and important for publishers to test out as another means to get in front of eyeballs but if they don’t add anymore value than simply a feed of content – not sure this will be as useful. If you look at the list of Bots available on the Kik Platform, I think there are some interesting applications. For example, Wirkin to find a job, H&M for clothing inspiration, and of course the Weather Channel (because we need more ways to know the forecast). Another interest space to watch is the Bot Platforms that allows you to build and host bots to integrate with the various end-user applications. For example, Meya.io is a platform player based in Waterloo, Ontario who is doing some interesting work on creating a platform for any company to quickly deploy bots for a variety of use cases. Another interesting platform is Pandorabots who are really helping businesses open up a new way to communicate with their customers. An exciting space for sure. To the title of my post, back in 2006, I was involved in a product to launch Canada’s first MSN Message Bot for finding location. 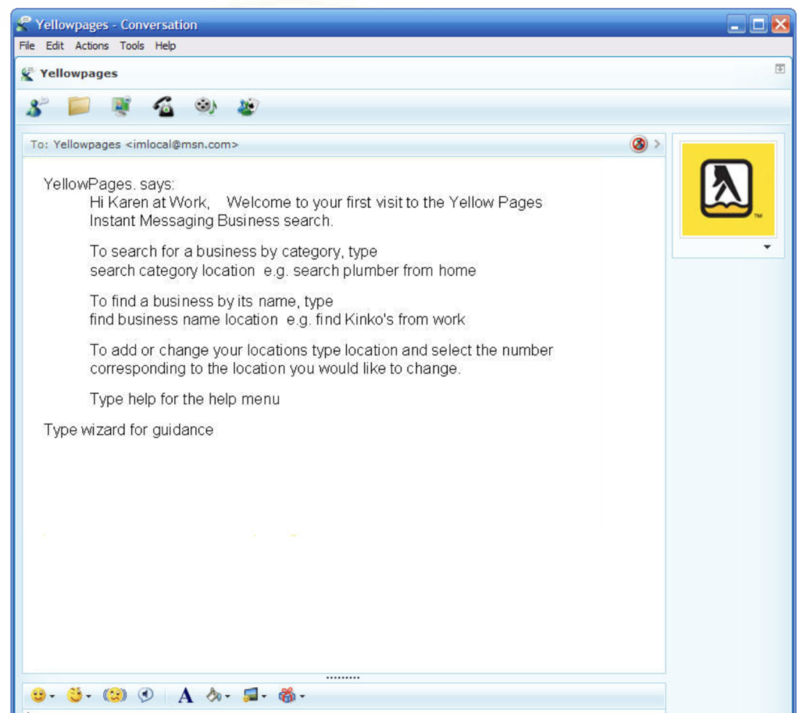 Yellow Pages Group partnered with a company called Illumicell (which became Poynt) who had a partnership with Microsoft and we launched YellowBuddy in 2006. It was a very interesting use case for us to understand how many people would use a Messenger platform in order to retrieve local information. We had a future plan of eventually being able to book, buy and deliver but our ambitions at the time where larger than the market was ready. I think we where a little too far ahead of the curve. The big game changer today is smartphones and mobile adoption. For those of you interesting, I have including some screenshots below of the original application. If you want to see all the screenshots, click on MORE tab. Hope you enjoy a little walk down history. 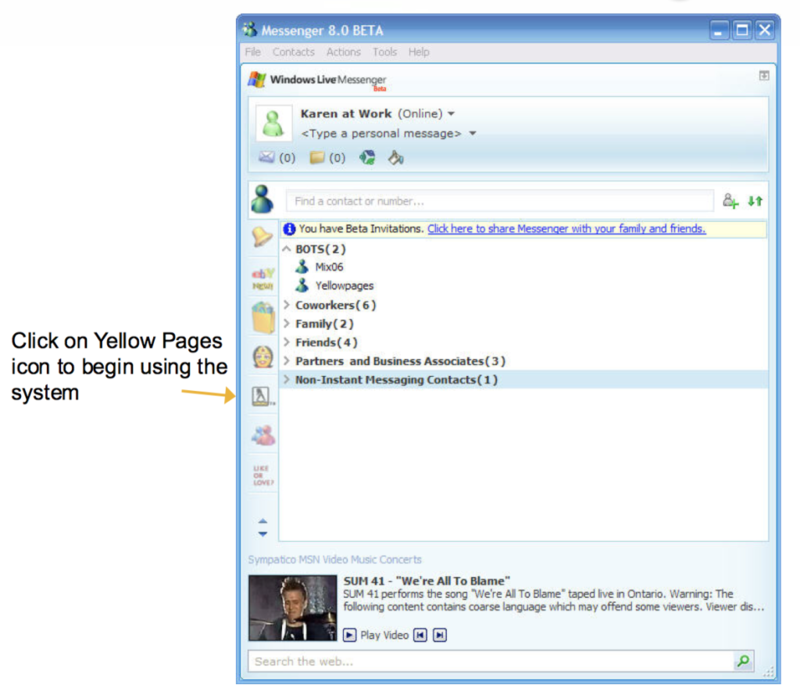 This entry was posted in Facebook, Intelligent Bots, YellowPages.ca Labs, YP and Local Search and tagged facebook F8, intelligent bots, messenger, MSN Messenger on April 22, 2016 by Darby Sieben. Blippy.com – Will You Share What You Buy? Through Facebook.com (my profile) we decided to share who we were, where we went school, our personal photos and more. Using LinkedIn.com (my profile) we decided to share everything about our business life and business connections. Twitter (my profile) allows us to share our 140 character thoughts. With FourSquare (my profile) we now check-in everywhere and share our location with our friends. Now there is Blippy.com – the service that allows you to share your purchases. On the Blippy.com website the tagline is simple : Blippy is a fun and easy way to see and discuss what everyone is buying. This past week I was forwarded this site to my colleagues and friends asking for their feedback. Some of them thought it was quite innovative in terms of asking your friends for feedback on whether they liked or disliked a movie or song. Others thought it was inappropriate to share this information on the web and flat-out told me they never would post their purchases online. Other thought it was completely stupid that somebody who post this info and that others would actually want to read it. One thing for sure is that Blippy.com evoked a reaction. I actually think this concept is interesting. Think about it – everybody shares with their friends and family what they like and dislike. Did you see that movie? What did you think of it? When people come over to my house, they ask us how do you like your massage chair or your 4-door fridge (these are 2 common questions we get from most people). You can read about my Inada Massage Chair purchase. Does Blippy.com allow people from long distances participate in those discussions? Could Blippy.com help you make better decisions by asking people in your network about a product or service? What about asking a total stranger on Blippy.com what he thought of a restaurant you have not been to before? Is this so different than facebook, twitter, foursquare or linkedin? Could Blippy.com be the next social phenomena? Will You Share What You Buy? This entry was posted in Blippy, Facebook, FourSquare, Social, Twitter and tagged Blippy, blippy.com, Facebook, linkedin, Twitter on March 12, 2010 by Darby Sieben. Do you like to share your opinion? If so – launched today is the $100 a day free gas card giveaway from the YellowPages.ca Facebook Application – see full contest details. Since the launch of this application, we have seen a growing numbers of users from across Canada share their opinions on restaurants, bars, dentists, health spas and this is a way to say thanks for those users to keep sharing their opinion with friends and family. On a personal note, I appreciate that my blog has been very quiet in the last couple of months and for everybody who emailed me asking me what’s up – thanks for emails and your concern. Besides being extremely busy in my position of Director of Online Services for Yellow Pages Group, I also made a move from Toronto to Calgary. Although the transition went extremely smooth, it is quite a ride to pick up your life and move over 3000 km’s. Anyway, I will be regularly contributing again, with more of a focus on what is being launched by the YellowPages.ca Labs Development Team as we continue to produce some great work in helping Canadians buyers connect with sellers. This entry was posted in Facebook, YellowPages.ca Labs on October 14, 2008 by Darby Sieben. As many of you know – my YP Labs team launched the YellowPages.ca Facebook Application back in May. I did a post on the television coverage by CTV – check it out. So what is the determining success in developing a facebook application? In the facebook world it really comes down to the number of installs of the application and more importantly the number of daily active users. At the bottom of this post, I will share some numbers on local search applications in facebook. Favorite Restaurants in Calgary – Map List. Favorite Sports Stores in Montreal – Map List. Favorite Toronto Restaurants – Map List. Great Restaurants in Port Perry – Map List. Places to Eat in Ottawa – Map List. Some interesting lists, including one for my favorite places to eat in Ottawa. Back to numbers of successful application usage. I grabbed these numbers from Adonomics.com, which aggregates usage on facebook applications. Here are some stats regarding application usage on facebook. Numbers are as of today. The most successful application, in terms of installs is SuperWall with just under 43M installs and a daily active usage of 2%. Funwall has the most active users at 1.8M from a total install base of 36.5M and a daily active usage of 5%. Scrabulous (now being sued by Hasbro) has 3.9M installs and daily active usage of 506K or 13%. This entry was posted in Facebook, Featured, Local on July 26, 2008 by Darby Sieben. Remember Friendster? One of those early social networking sites. Well as of this week, they have made a couple of key announcements that could help bring friendster.com from the depths of the Canadian Internet space to – perhaps a competitor to facebook? Well – let’s not get carried away, but they have announced opening up a developer network as well as integrating with OpenSocial – both positive steps in the right direction, however, probably a little late – at least in the Canadian market. For the full story please read, Friendster developer platform goes live with over 180 apps. From a local business perspective – your best bet is still facebook.com as a vehicle to communicate with your customers and friends. With the launch of facebook’s business solutions – there is a very viable solution for local businesses to get involved in the social space. However, what about friendster? You know, at one point, they had a great service but what they are doing now is reactive not proactive. They, like myspace, are in reactionary mode to facebook and this is a touch position for any business to be in. Anyway, as a FYI – here is a 12-month media trend comparing facebook.com, myspace.com and friendster.com in Canada – the graph speaks for itself as to what Canadians are using and where local businesses in Canada need to be. This entry was posted in Facebook, Social on December 15, 2007 by Darby Sieben. Currently at the Kelsey Conference in LA and had an enjoyable time listening to Chamath Palihapitiya, VP Product Marketing and Operations for Facebook. He was speaking about facebook and its product with respect to advertising – I am currently doing some testing and will have a future post on my findings with respect to their ad platform from a Canadian perspective. This entry was posted in Facebook, Trends on November 29, 2007 by Darby Sieben.